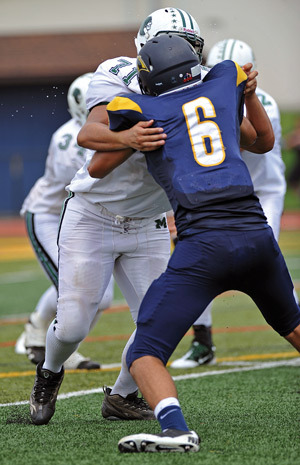 At the United States Naval Academy (USNA) our opponents on the football field often outweigh our linemen by 50 to 60 pounds. This weight disadvantage causes greater-than-normal stress on the great toes and forefeet of our players, who are trying to play off the blocks and rushes of these much larger athletes. The USNA sports medicine staff has been tracking and trending detailed data on injury rates since 1996 and has noted its concern about a demonstrated an alarmingly high number of foot injuries. From 1996 to 2006, the USNA sports medicine staff noted an average of about 30 injuries per year. In the last five years at the academy, staff documented 139 such injuries. There have been 3.5 times more forefront and midfoot sprains in the fall season compared with the spring season. All football seasons averaged between 30 and 32 injuries, with one outlier, a year in which 41 injuries were reported. Specifically, the staff expressed concerned about hyperextension injuries of the first MTP joint, commonly referred to as “turf toe,” as well as injury to the tarsal–metatarsal (TMT) joint complex, or Lisfranc sprains. Both turf toe and Lisfranc injuries can end the season for athletes, as powerful push-off requires stable and pain-free MTP and TMT joints. Figure 1. The authors fabricated the prophylactic orthoses from stiff-milled plastic with an indention, or pressure well, beneath the first metatarsal head, for use in football players’ shoes. Push-off is significantly impaired and forward running is greatly compromised.1 Mild sprains can be treated with rest, ice, elevation, and taping to immobilize the joint for one to two weeks. A more serious sprain can require three to four weeks of recovery before the athlete can return to sports. A severe sprain, however, often necessitates six or more weeks on the injured list, and residual stiffness, pain, or instability can end athletes’ careers.8 Coker et al9 noted that turf toe injuries caused double the time missed compared with sprained ankles. Figure 2. Images show how the researchers created an indentation (highlighted) for the metatarsal-phalangeal joint. The USNA football team equipment manager issues cleats to the players based on the manufacturer’s guidelines, which are determined by the player’s weight, his position, and the field surface. The linemen’s shoes are stiffer than specialty players’ shoes, yet the manager noted that some players frequently gravitate to lighter shoes because of their perception that a lighter shoe is associated with an increase in performance and speed. Our players have been observed in the dressing room holding two different pairs of shoes and trying to identify the lighter pair. These players often know a player who has had a season-ending injury, but even knowing the benefits of a stiffer, heavier shoe, they still want the lighter shoes. One of the offensive linemen was picked at random to have his feet cast for a trial pair of custom orthoses. 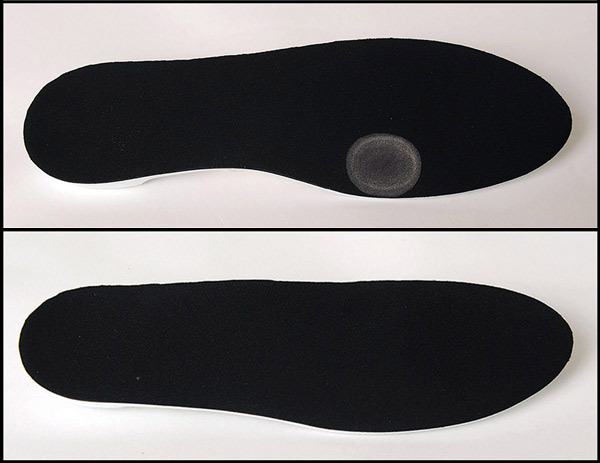 After getting positive feedback about the comfort and fit of the orthoses, the only adjustment was to move the indention under the big toe more medially, closer to the edge of the device. This player did not dress for play during any official games, so had no opportunity to test the inserts during actual game play. In addition, follow-up with this player revealed that he had some reservations about giving negative feedback and had found the inserts less comfortable than he originally indicated. We selected the players for this study based on the positions they played, i.e., offensive and defensive line. Team orthopedists and podiatrists screened the team players prior to fabrication of the foot orthoses. Half of the players were scanned with an orthotic laser scanner for fabrication of full-length inserts. The other half had their feet cast for the traditional slipper cast used in the fabrication of orthotic devices at the USNA Orthopedic Clinic. 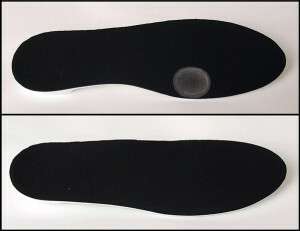 A single laboratory milled all the orthoses using a CAD-CAM system; all orthoses were made of homopolymer polypropylene. From the conception of this study, our research group understood that the hardest part of the project would be player compliance. Our experience has shown that it is difficult to get players to wear additional protective gear that they consider uncomfortable or restrictive, and which they sometimes perceive as being intended to prevent an injury they don’t think they’ll ever have. Since the orthotic devices were not visible, a simple “eye-ball” check during practice or games was not possible, and asking each lineman if he was wearing the prescribed inserts was not a practical solution. At the conclusion of the football season we requested that all players fitted with custom orthotics fill out a survey about their experience with the prophylactic foot orthoses. 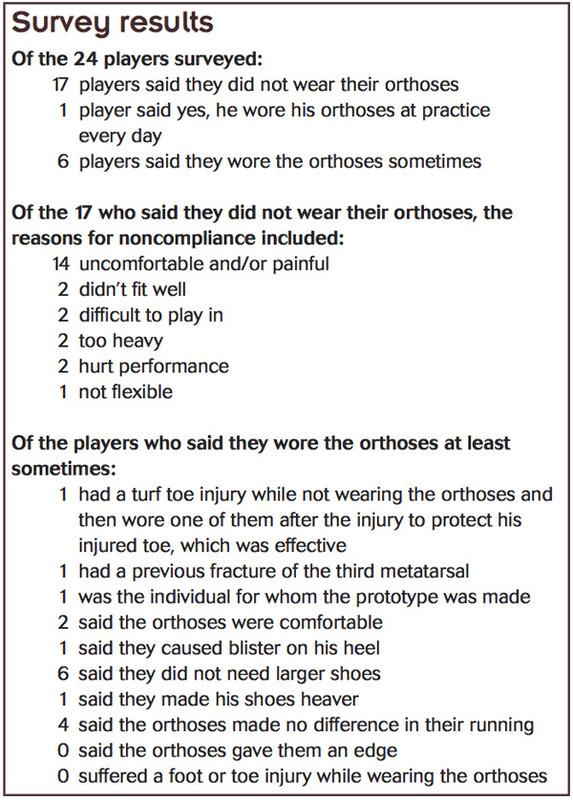 The survey results showed a majority of players didn’t wear their orthoses (see table). Players reported several reasons for noncompliance, but the most common explanation was that the foot orthoses were uncomfortable and players felt the devices reduced their ability to play at a competitive level. This is the conundrum that has always plagued athletics: you can make safety gear that will prevent injuries, but players will not wear that gear unless it is comfortable and doesn’t make the athlete feel that it negatively affects performance. At the end of the 2011 football season our records showed that players had no Lisfranc injuries and experienced only four turf toe injuries (at all positions, not just linemen). Our records for the last five years (2006-2010) indicated an average of 14 turf toe injuries and two Lisfranc injuries. Obviously, the less-than-average year for turf toe and Lisfranc injuries in 2011 can not be credited to the use of the foot orthoses because they were not worn by a vast majority of the players—therefore, the reduction was either coincidence or luck. Of note, we have found that compliance is much easer when these same foot orthoses are used postinjury, a pattern we have also noted with other devices, including braces. In our experience, this type of foot orthosis can be very effective in providing support and comfort primarily due to the indentation under the ball of the foot. This device helps the players return to practice and competition much sooner. We have not had any recurrent injuries in this patient population. The medical staff at the USNA was concerned about the number of foot sprains sustained by their football team and tried to reduce risk through by fitting all interior linemen with full-length custom inserts to stiffen the forefoot. Despite counseling participants about the potential safety benefits, the vast majority of athletes did not use the inserts, citing a lack of comfort as the primary reason. No conclusions can be drawn from such an informal intervention in such a small cohort. However, the authors have a greater appreciation of the players’ strong preference for lightweight and flexible footwear over heavier and stiffer shoes, which might help prevent injury. We gained some useful information in our quest to prevent toe and forefoot injuries in football linemen, namely that light weight is key and comfort is also a concern. (In our experience, football players’ descriptions of comfort versus noncomfort is likely based on personal preference and pain levels.) We need to use lighter, thinner (possibly 2-mm instead of 3-mm) orthotic material as our conversations with players have taught us that weight is their primary concern; they feel anything that adds weight can potentially subtract from speed. The orthotic devices we used for this investigation were very useful for postinjury care of turf toe injuries and midfoot injuries. Like the prophylactic knee braces worn by football offensive linemen that have become standard equipment, we believe that either shoe manufacturers will need to continue to make changes to the football shoe for linemen or some type of prophylactic orthotic device will slowly gain acceptance for players in the high-risk group. Sprains of the MTP joint and TMT joint complexes can constitute the majority of athletic foot injuries,12 and football linemen are especially at risk.13 The emphasis on speed is paramount, and manufacturers are making football cleats lighter and more flexible than ever. Given the choice, every player, including a 280-pound lineman, will generally choose the lightest shoe possible—even if it goes against the manufacturer’s recommendation based on his size and position. As the lightest and most flexible shoes tend to be preferred by all players regardless of their size and position, the authors feel it is important for trainers, coaches, and others who issue athletic shoes to educate the players and equipment managers properly about the importance of adhering strictly to manufacturers’ guidelines. Jeff Fair EdD, ATC, is the associate athletic director for sports medicine at the United States Naval Academy (USNA) in Annapolis, MD. CAPT David Keblish, MD, is an orthopedic surgeon and a team physician and LCDR Anthony Rabaiotti, DPM, is the team podiatrist, both at the USNA. Disclosure: The views expressed in this article are those of the authors and do not necessarily reflect the official policy or position of the Department of the Navy, Department of Defense, or the US government. 1. Clanton T, Ford JJ. Turf toe injury. Clin Sports Med 1994;13(4):731-741. 2. Bowers KD Jr, Martin RB. Turf toe: a shoe surface related football injury. Med Sci Sports 1976;8(2):81-83. 3. Umans HR. Imaging sports medicine injuries of the foot and toes. Clin Sports Med 2006;25(4):765-780. 4. Baxter DE. The Ankle and Foot in Sport. Baltimore: Mosby; 1995. 5. Adidas changes game with lightest football cleat ever. www.news2know.net/mnr/adidas/lightest-football-cleat-ever.php. March 1, 2011. Accessed January 7, 2013. 6. Nike website. www.nikestore.com. Accessed January 7, 2013. 7. Under Armour Highlight CompFit Pro Bowl Cleat Lineup. http://solecollector.com/news/under-armour-highlight-compfit-pro-bowl-cleat-lineup/#axzz2LM29w4ky. Accessed January 7, 2013. 8. O’Donoghue D. Treatment of Injuries to Athletes. 2nd ed. Philadelphia: W.B. Saunders Co; 1970. 9. Coker TP, Arnold JA, Weber DL. Traumatic lesions of the metatarsophalangeal joint of the great toe in athletes. Am J Sports Med 1978;6(6):326-334. 10. Cooper DL, Fair JD. Turf toe. Phys Sportsmed 1978;6:139. 11. Subotnick SI. Podiatric Sports Medicine. New York: Futura Publishing Co; 1975. 12. Clanton T. Athletic Injuries to the Soft Tissues of the Foot & Ankle. St. Louis, MO: Mosby; 1999:731-741. 13. Nihal A, Trepman E, Nag D. First ray disorders in athletes. Sports Med Arthrosc 2009;17:(3):160-166.